The interface of the waveshaper and the helpfile. This is a monophonic waveshaper bass synthesizer I programmed in Max 7. It can be used as an abstraction or bpatcher. The shaping is done by using the jit.bfg object. You can select a slice of the 3D plane that displays the basis function with the slider. 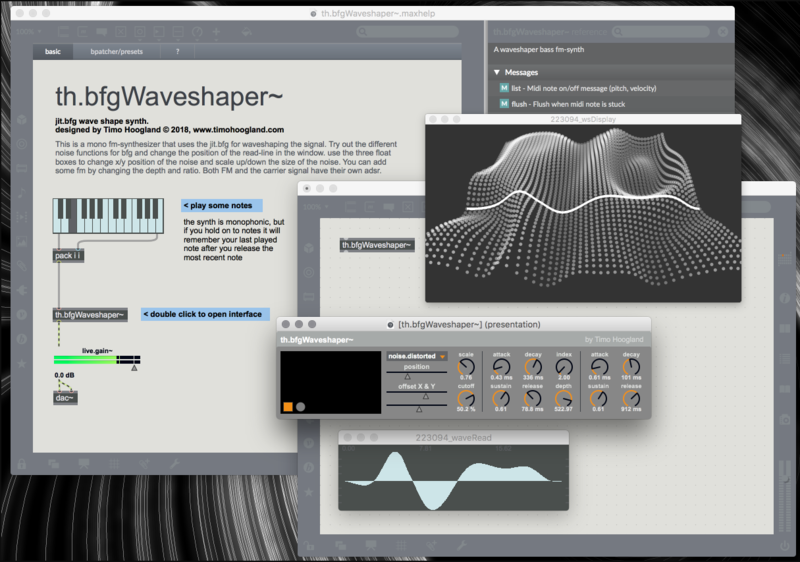 The slice is then used for waveshape distorting an fm synth made with sinewave oscillators. The selected slice of the plane gets windowed (so the sample always starts and ends at 0 for smooth transition) and is stored in a buffer. I use the poly object to give it a 4x upsampling to get rid of a lot of aliasing. It has 2 ADSR's, one for the FM modulator and off course one for the complete instrument sound. While it is monophonic it will remember your previous played notes and velocities when still holding on and pressing an extra key. On release of the new key it will slide back to the previous (still held) note.